Join us as Alan A. 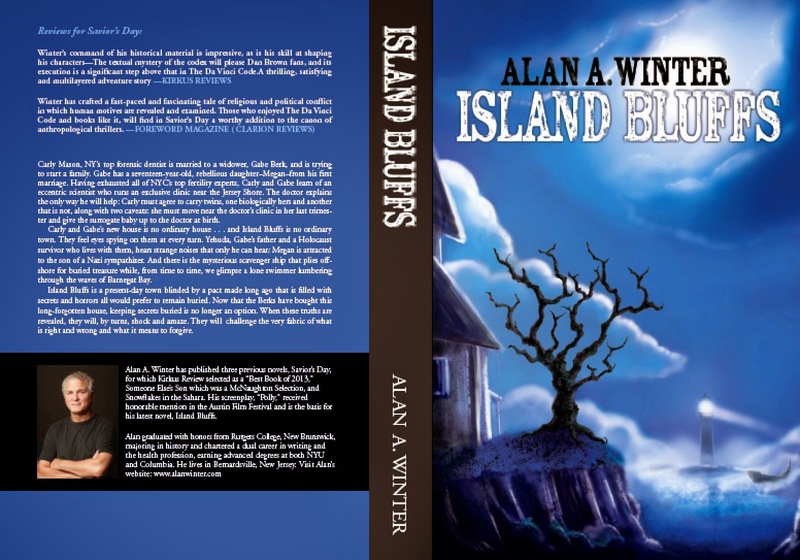 Winter, a noted author, shares his experiences on how he came to write his latest novel, “Island Bluffs, which is loosely based on true events and uses LBI as its backdrop. Imagine buying the house of your dreams on Barnegat Sound only to have a stranger try to buy it from you the day you move in? Imagine how your octogenarian father – a Holocaust survivor – must feel when it is discovered that your new house had previously been owned by a German spy? Imagine strange happenings occurring in this house that cannot be explained by natural events? And imagine how an impish fertility expert, who is a survivor of the Mengele twin experiments, uses his extraordinary intellect and wealth to devise a grand scheme to alter how anti-Semites view Jews? Alan’s last novel, “Savior’s Day,” which traces the mysterious disappearance of the missing pages of the Codex of Aleppo, sanctified by Maimonides as the greatest Bible ever written, was acclaimed by Kirkus Reviews as a Best Book Selection of 2013.